The Spirit of St. Louis, flown by Charles Lindbergh, made the first solo non-stop transatlantic flight from Long Island, New York, to Paris, France departing on May 20th and arriving on May 21st, 1927. 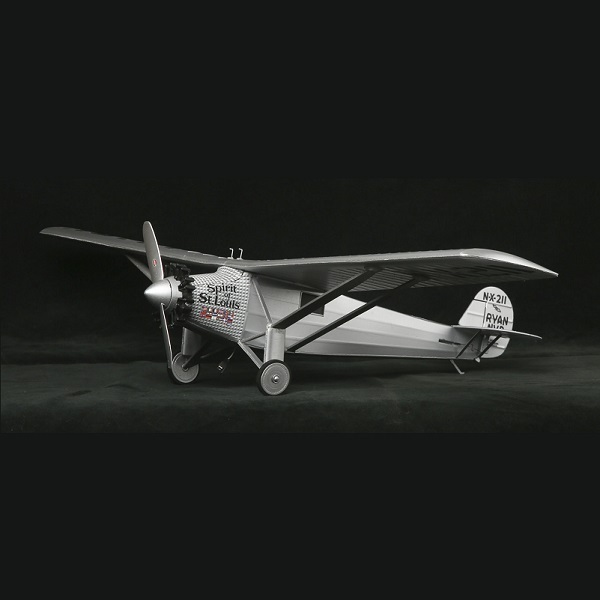 Officially known as the "Ryan NYP" (for New York to Paris), the Spirit of St. Louis was a custom-built, single engine, single-seat monoplane designed by Donald A. Hall of Ryan Airlines. It was named Spirit of St. Louis in honour of Lindbergh's supporters from his hometown of St. Louis, Missouri. To save design time, the NYP was loosely based on the company's 1926 Ryan M-2 mail plane with the main difference being the 4,000-mile range of the NYP. As a non-standard design, the government assigned it the registration number N-X-211 (X for "experimental"). More than any other airplane, the Spirit of St. Louis captured the imagination of the country and led to the Golden Age of flight in the US. Due to extremely light wing-loading, the Rage Spirit of St. Louis provides smooth, yet capable flight performance (either indoors or outdoors in light winds) that's ideal for sport or expert pilots. Experience the nostalgia of the original with scale features that include a highly-detailed scale 9-cylinder Wright Whirlwind dummy engine, a full-airfoil wing design with rib details and fuel tank vents, detailed scale landing gear and struts, and even the official name - "Ryan NYP", and registration number N-X-211 in realistic scale water slide graphics on the tail. The Spirit of St. Louis comes fully assembled as a RTF (Ready-To-Fly), so everything needed to fly comes included in the box. In addition to the scale airframe with the installed 3-in-1 control board, you get a 2.4GHz transmitter that conveniently charges the included 1S 150mAh LiPo battery. Even the AA batteries needed to power up the transmitter are included, so you can be making your maiden flight on this amazingly detailed, historic airplane within minutes of opening the box!  Packaging functions as storage and carry case eliminates hangar rash.